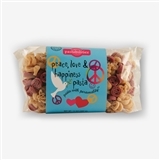 Serve with your favorite sauce or include in soup these noodles shaped like peace signs, doves and hearts, adding love and understanding to lunch, dinner, recitals and potlucks - the package also includes a tasty recipe for Pasta Lemon Shallot Sauce sure to satisfy. 14 oz. bag of all natural semolina pasta noodles, made from durum wheat. Made in the USA. A ballet dancer in arabesque provides a pretty place for you to keep your favorite rings and earrings. 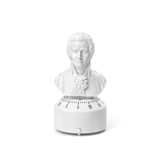 Coated steel, set includes a 7" x 7" ballerina figurine held in place atop a 3 3/4" diameter tray by a small magnet. Got music on your mind? Keep those tootsies warm with these fun cotton blend socks in a blue and black music note pattern. 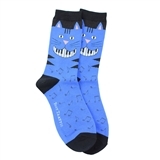 Rock these socks and show off the smiling cat with piano teeth on the side - so soft they will make your feet purr. Fits women's sizes 4-10. With a dozen designs to choose from, these music-themed totes are sure to suit your needs. If you buy five or more the price drops by $1 each. 100% organic cotton. 13" x 15", with 9" drop handles. This cat's got her priorities right, hanging out where the music is. Fitted women's size. 100% pre-shrunk combed cotton. Printed in the USA. Make your own ukelele, decorate it, play it! How cool is that? A great gift for kids and adults too. This DIY kit comes with all the necessary parts to make your own and play your favorite tunes. Use this warm all-cotton garment as a unique alternative to a light jacket. Woven in the USA. This lined cotton canvas bag features two zippered pockets, two side pockets, interior keys hook, messenger flap with magnetic closures and adjustable strap. An entwined treble and bass clef form an elegant heart that's the perfect gift for a loved one. Silver plated 1 1/2" pendant comes on an 18" silver plated chain with 2 1/2" extension. Gift boxed.